St. Marks NWR and the end are just two flights away! Their January 24 flight gained 58 miles to Decatur County, Georgia. After about 20 minutes of wrangling, the birds fell into line. The rodeo and the trashy air aloft tired #11-15, the youngest bird, who dropped out just seven miles short of the new stopover. Again, #2-15 was crated and driven because she picks fights for lead position and leads the other birds astray. Next stop: FLORIDA! We have 60 miles to go and one more stop between the current location and the final destination in Wakulla County, FL. This year's finish will be the last. 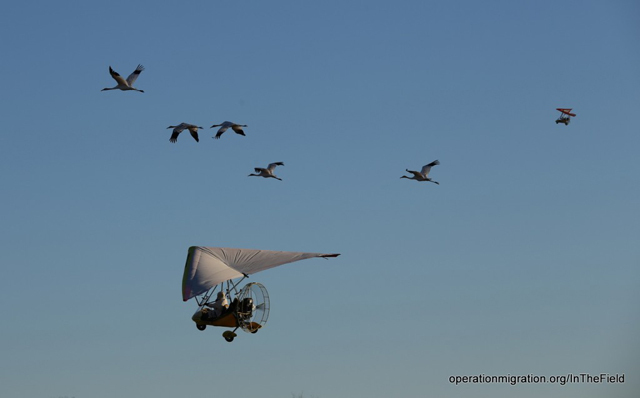 In meetings of the Whooping Crane Eastern Partnership (WCEP) last week, the decision was made to end aircraft-led migrations. Thanks to the Operation Migration team, 100 birds are in the Eastern Migratory Population that would otherwise not be there. "These birds survive, they migrate, they pair and they are wild," points out project leader Joe Duff. "Now we need to teach them to be good parents." 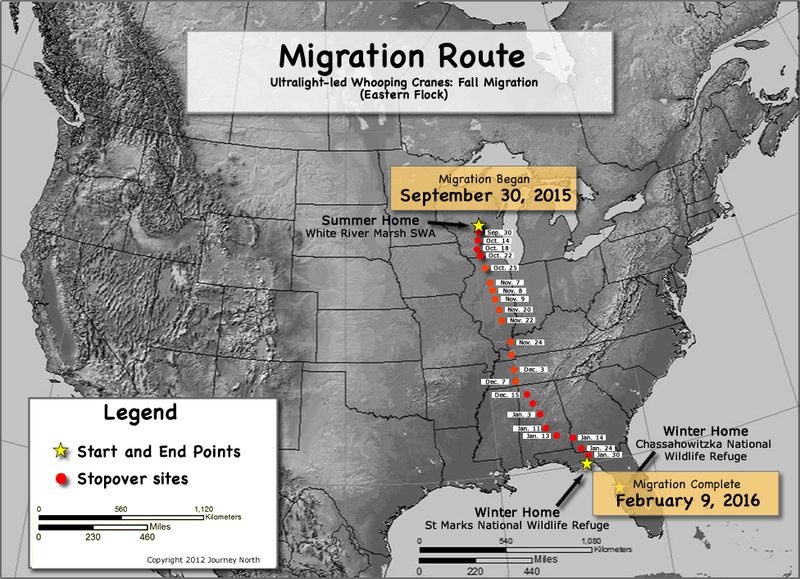 The goal is recovery of the Whooping crane where birds are raising birds. For now, watch for our news flash, and stay in touch daily at Operation Migration as the end of an era nears. Pilot Brooke Pennypacker led the charge January 24 with Richard van Heuvelen flying in the chase position. Journey North is presented by Annenberg Learner. Partial funding for this news update has been made possible through Operation Migration by the National Fish and Wildlife Foundation and the Southern Company through the Power of Flight Program.